A wide range of antiques and collectibles from over 30 different stall holders. Usually held fortnightly on the 1st & 3rd Sunday of each month. 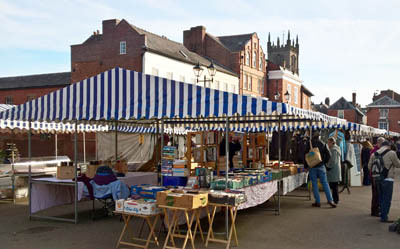 Ludlow has held street markets since the 12th century. Nowadays, a traditional open-air market, managed by Ludlow Town Council, takes place in the town square (Castle Square) every Monday, Wednesday, Friday and Saturday throughout the year. In addition to the regular market, most Sundays see the market stalls being used either as a Antiques & Collectors Market or for various specialist themes such as books, gardens or crafts.